Creighton All-American forward Doug McDermott is one of the best players in the nation. Marquette knows a thing or two about making an impression when entering a conference. A thorough beating of then No. 2 Connecticut in front of an amped up crowd at the Bradley Center in January of 2006 let the rest of the Big East know the Golden Eagles were a serious threat in their new league. Fast forward nearly eight years and Creighton is looking to do the same thing Tuesday night. Much like that tone-setting night in Milwaukee, the hype for the New Year’s Eve night Big East opener in Omaha, Neb. is incredible. The Bluejays and their faithful have been looking forward to this game ever since Creighton officially joined the Big East in July. Combine over 17,000 fans who have patiently waited for Tuesday night with one of the more talented teams in the conference, Marquette is in for quite the challenge. "I think it’s going to be unbelievable," Marquette coach Buzz Williams said. "I think we’re walking into a buzz saw, and I think they’re waiting." A buzz saw is exactly what Connecticut walked into back in 2006. Former Marquette star Steve Novak hit 12 of 20 shots and 6 of 13 3-pointers to score 41 points in the Golden Eagles’ stunning 94-79 upset victory over a Huskies team featuring six future NBA draft picks. Though he wasn’t there, Williams has heard plenty about how great the atmosphere was that night and expects to face something similar. "I think they are hyped and ready to go," Williams said. "Everybody that will be wearing royal blue and white and hollering for the Bluejays are really excited that we are coming to town." Creighton, like Marquette back in 2005-06, certainly isn’t a stranger to big-time college basketball. The Bluejays have made the NCAA tournament eight times since 2000 and have won 18 conference championships. But this is the first time Creighton has been in a major conference. This is a big deal to everyone involved. The school sold 15,000 season tickets for this season and single-game seats for Tuesday’s game against Marquette sold out in roughly 10 minutes. Standing-room only tickets will go on sale at 10 a.m. Tuesday and are expected to be snatched up in no time. 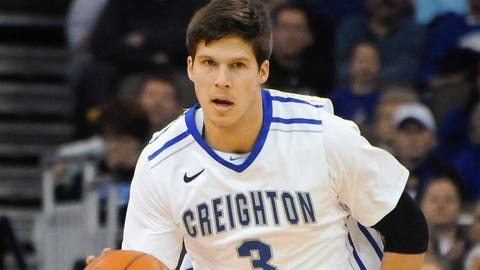 "It’s what we’ve all been waiting for, fans, players and coaches," Creighton All-American forward Doug McDermott said. "This is the one to get started off on the right track. Marquette is one of the better teams in the league, so it’s going to be a huge challenge. "I expect a Wichita State-type atmosphere from last year (when Creighton clinched Missouri Valley conference title) here Tuesday night. It should be a great game with two really good teams going at it." While a loss Tuesday won’t crush Marquette’s NCAA tournament hopes, the Golden Eagles certainly need a big win. Marquette was picked to win the Big East in the preseason but struggled a bit through a tough nonconference slate. A win on the road at Creighton would not only be an important one for Marquette, but also a big shot in the arm moving forward in conference play. But it’s going to be a challenge. McDermott is one of the best players in the nation, averaging 24.8 points and 7.3 rebounds per game while shooting 49.0 percent from the field, 90.4 percent from the free-throw line and 42.3 percent from beyond the arc. Finding a way to make things difficult for McDermott is a big key, but Creighton has five players making over 40 percent of their 3-pointers. The Bluejays are third in the nation in 3-pointers made per game at 11.3 and 3-point percentage at 43.7. "If you are going to give us an open 3-point shot, that’s the best percentage shot we can get," Creighton coach Greg McDermott said. "The numbers say we are going to make between 40 to 45 percent of them. If you do the math, that’s a little over 12 points every 10 possessions. That’s good enough to win a lot of basketball games." The Creighton coach went out of his way to let it be known the Golden Eagles are still a threat despite their 8-5 record. "They played one of the best schedules if not the best schedule in the country," Greg McDermott said. "That’s part of the reason why their record isn’t as glamorous as it has been in the past. They’ve gone on the road and have played good people, and they’ve come up a few possessions short in a few of those games. It will be pretty electric in here Tuesday night." But in order for Marquette to walk away victorious, the Golden Eagles are going to have to be able to handle the environment. This is a statement game for Creighton, a school looking to show the rest of the country what basketball games at the CenturyLink Center are like. McDermott’s father and coach, Greg McDermott, agreed with the way his son summed up the excitement level the Bluejays have playing their first Big East game. "You only get one chance to play the first game of something," Greg McDermott said. "This is the first game in Creighton’s history in the Big East. It’s something our players 50 years from now can tell their grandkids that they played in the first Big East game Creighton ever played in. Hopefully they can tell them they won that game. "I think it’s going to be a lot of fun. I think there’s going to be great energy in the building and obviously we’re going to have to play really, really well because I have tremendous respect for Marquette." Wilson update: As of Monday evening, Marquette senior forward Jamil Wilson’s status for Tuesday’s game was still up in the air. Wilson, who is Marquette’s second-leading scorer at 11.7 points per game, injured his left knee in the first half of Saturday’s blowout victory over Samford. He played just five minutes and didn’t return after crashing to the floor after being fouled hard on a dunk. While Wilson is needed by the Golden Eagles for a variety of reasons, the 6-foot-7 versatile forward is probably Marquette’s best defensive option on Doug McDermott. Without him, Williams would likely have to turn to Juan Anderson to start on the superstar. Time change: Marquette’s game against Xavier at the BMO Harris Bradley Center on Feb. 15 has been bumped up to a 3 p.m. start. The school announced the change Monday, as the game between the Golden Eagles and Musketeers was moved up from a 5 p.m. tip to accommodate national television. Originally slated to be aired on FOX Sports 1, FOX will now have the broadcast.